Browse: Home / Medusa v-2.2rc1 released : is a speedy, parallel, and modular, login brute-forcer. Medusa v-2.2rc1 released : is a speedy, parallel, and modular, login brute-forcer. Medusa is a speedy, parallel, and modular, login brute-forcer. 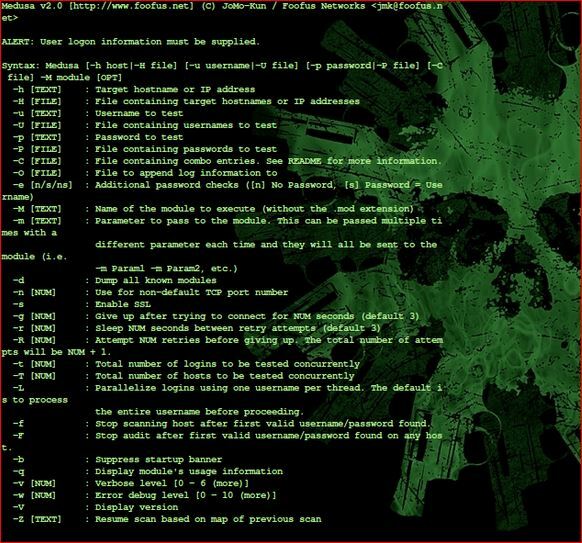 Medusa is a speedy, parallel, and modular, login brute-forcer. The goal is to support as many services which allow remote authentication as possible. + Thread-based parallel testing. Brute-force testing can be performed against multiple hosts, users or passwords concurrently. + Flexible user input. Target information (host/user/password) can be specified in a variety of ways. For example, each item can be either a single entry or a file containing multiple entries. Additionally, a combination file format allows the user to refine their target listing. + Modular design. Each service module exists as an independent .mod file. This means that no modifications are necessary to the core application in order to extend the supported list of services for brute-forcing. + Multiple protocols supported. Many services are currently supported (e.g. SMB, HTTP, POP3, MS-SQL, SSHv2, among others). ← OS X Backdoored ping.